Further to my previous post, I’ve finally had some time to look more closely into openbadges integration. What I’m discovering is that from a WordPress point of view, badges are still largely thought of as an engagement layer – a somewhat superficial achievement set to motivate users to engage with your content. What gives this away is the fact that the only automated award options across any of the plugins I’ve looked at (will try and do a comparison in another post given there’s not really anything around on that) is based on basic engagement actions like logging in or posting a comment (unless you’re running Buddypress Courseware – but I don’t, that’s naughty even for me :D). You aren’t able to automate awards triggered by any interaction deeper than that – for instance, posting a comment on a specific post. You still have the option for manual awarding of badges for whatever you like but if we want to tick the buzzword boxes like ‘scalable’ it’s not really a viable option. Now perhaps for the gamification set this is sufficient, for the purposes of trying to increase student engagement in a simple quantifiable sense (ie avoiding tumbleweeds), but if my goal is to use badges for microcredentialling professional development the available plugins (at least, the free ones) aren’t quite there yet. Which leads me to the fact that I may have to eat my words, a little bit, because the implementation of openbadges in Moodle 2.5 is much more sophisticated in this regard, and I suspect this will be what draws me back to doing cool stuff in Moodle again. Because Moodle 2.x has a fairly good conditional release and activity completion set, the options for automated issuing of badges are much richer and more targeted. Badges in Moodle appear to be implemented specifically for microcredentialling, with engagement layers and gamification likely to be an afterthought that gets exploited, coming to a teaching and learning conference near you. So why do I care about the difference? After all, aren’t I the person who gamified Moodle (sigh)? I have no interest in an arbitrary feature set that exists solely for the purposes of bribing people to participate with pretty coloured gifs. But – I have a real use for something that lets me track completion of a course or event and give some sort of recognition to people for that completion, given that we’re unable to offer “proper” credit points and we have a PD requirement for new staff. As @ghenrick points out, “if a resumé or CV is a bunch of claims, Open Badges are a bunch of evidence”. This is the real strength of openbadges, and it’s why you need a slightly richer feature set than just ‘log in and engage with my site in some way’. And this is where my appropriation rant falls down, because the non-edu world, being largely unconcerned with credentialling in general, just hasn’t quite got past the engagement layer with badges yet. I’m not quite sure where this leaves me given Coffeecourses is in WordPress and not really portable into Moodle, but I’ll stick a category on this train of thought and you can follow my progress. I have to admit that I have avoided OpenBadges until now, mostly through rightly or wrongly correlating them with gamification. I am not big on -ification of any kind but take particular issue with the addition of superficial motivation layers over unchanged, non-game-like content and the awarding of badges just for the hell of it (or under the guise of ‘engagement’). Which means I have mostly discounted the existence of OpenBadges. Until now. Most of you are aware that for the last while I’ve been dabbling in wholly online delivery of professional development via Coffeecourses (which I realised to my dismay the other day is probably an accidental MOOC of sorts). However one sticking point with it has been the ability to track completion and offer credentialling. The use of e-commerce software means registration can be easily tracked, but so far completion has been an honesty system of sorts, given that commenting on each activity is optional. However a couple of weeks ago I read this post by @marksmithers, who is perhaps one of the few people around who is more skeptical than I am about things, which made me rethink my stance on OpenBadges and badges in general. Effectively they are a simple method of scalable and sustainable (in that they can be automated) micro-credentialling, and don’t necessarily have to have anything to do with gamification at all. So – I’ve started to play. I’m investigating WPBadger, which integrates with OpenBadges, and BadgeOS, which lets you create open badges (which are not Mozilla badges) that are shared via Credly. With any luck this will allow me to award automated credentials for completing coffeecourses. Ultimately it would be excellent if one could collect such badges, and badges from other professional development, and aggregate them towards a ‘proper’ credential like a GCHE – but I suspect that’s crazy talk. At any rate, watch this space. Or more accurately, this space. It has recently come to my attention that those of us who work in professional development, particularly in schools and universities cf industry, are missing a rather large boat. A huge, glaring boat. Generally if you are an educator in a university or school, you have a fairly extensive list of restrictions you are working with whenever you attempt to do something new and/or innovative with your teaching practice. You have both institutional and governmental red tape to comply with, administrative processes to follow, institutional structures, set content and/or assessment etc etc. Change is difficult to effect. There are many rogues and cowboys out there doing cool stuff regardless, but generally, as an industry education is far from agile and conducive to innovative practice. But – professional development (as an entity in education) is almost entirely unregulated. Almost none of these restrictions apply to us when we are designing training and PD programs. And yet this is an almost universally wasted opportunity. We fill our PD programs with face to face workshops that are generally only a computer click or two away from a lecture. Powerpoint presentations. Paper handouts. We’re presented with a situation which perhaps more than any other scenario in education facilitates truly innovative design, and we’re dropping the ball rather badly. Now I am aware this is partially a market demand thing. Most people who are the consumers of professional development have the workshop model as their primary concept and this tends to be the expected and requested model. But – somebody has to start changing the status quo somewhere. We should be taking advantage of this opportunity to start a trickle of creative thinking, innovative practice and cool stuff, not biding our time with the same old. Coffeecourses was kind of a nod in this direction on my part, but we still have a long way to go. Now excuse me while I go write a conference presentation on this. I’ll make sure you all get a printout of my slides. As most of you will be aware my PD project for this year was Coffeecourses – a completely different design to the standard workshop model of professional development. It’s been running for about six months now and I thought it was about time to take stock on it. I generate all the content. Really struggling with this aspect. I know that everyone got quite excited about it initially and I still like that I’ve done something that gets away from the standard workshop model, but these last few points for me I think are deal-breakers. A conversation with @s_palm and @daveowhite the other night about old wine in new bottles (which was about moocs but the principles still stand) rings a little too loudly here – have I really done something all that different? The format has changed, but is it really just talking at people in a chunked-up, asynchronous, RSS-delivered open way instead of in a room with a slide deck? The choice I have now is whether I keep it going and tweak it, or scrap it and start designing something completely different (which, tbh, I am already doing in the back of my head). Thoughts? Although I’ve talked about the follies of demand-driven education before (here and here), I’ve yet to approach it from the point of view of professional learning or professional development. Which seems rather an oversight, really, given my current line of work. We (meaning a central learning & teaching division) are currently undergoing a review process, and one of the things that arose out of the report was the need to realign ourselves as a ‘service’ division to service staff professional development needs more fully. Now, I have no problem with the idea that our job is to serve and assist teaching staff – where we run into problems is when we start considering which stakeholder (ie us or them) is going to be driving this process. It’s not particularly often you find an apt metaphor in an irritating viral video, but today is one of those days and I’m only going to apologise a little bit for what I’m about to do*. Let’s take ‘us’ (and while anyone in central learning & teaching centres will recognise this quite explicitly anyone in any line of edu will be able to extrapolate) as the lemonade vendor. We spend a lot of time designing and making lemonade. We think the lemonade is pretty awesome, and feel reasonably justified in this since we try and stay on top of bleeding-edge practice and know what current really innovative practice is starting to look like. We go out to sell the lemonade to people because we’re thinking it could do some cool things to reinvent student learning. So we set up our stand, but the first customer comes along and asks if we’ve got any grapes. Grapes? Huh? Oh well. Even if they think they want some grapes we’re selling lemonade so we try and convince them that lemonade is a really good option and they should have that instead. No dice. The next day the customer is back, still looking for grapes. It’s a bit annoying really, because we clearly sell lemonade. Lemonade that is awesome. We know this because we’ve even taken our lemonade to conferences and a bunch of people have gotten really excited about it and have been asking for our recipe. But this guy still wants grapes. A few more repeats of this and we start to get really annoyed (I won’t lie, I have wanted to glue the odd person to a tree). Eventually we get so irritated we give in and go and buy some grapes especially for the customer since they want grapes so badly. Which is fine – until the customer goes to, say, a keynote or reads something in Campus Review about how awesome lemonade is and how lemonade is the future of education. And we’re standing there with our box of grapes while the customer is asking us for lemonade. Now that I’ve done the metaphor to death, it’s fairly clear that there are some significant issues with both models. From one end, if ‘we’ are designing professional development programs (based on things like research), we run the risk of selling something that nobody wants to buy (and thus the perception that we aren’t actually selling anything at all). But if we are designing PD based on market demand – on what ‘they’ want (based on things like practicality and perceived need) – we run the risk of never innovating or changing at all (until somebody catches a buzzword in the media). 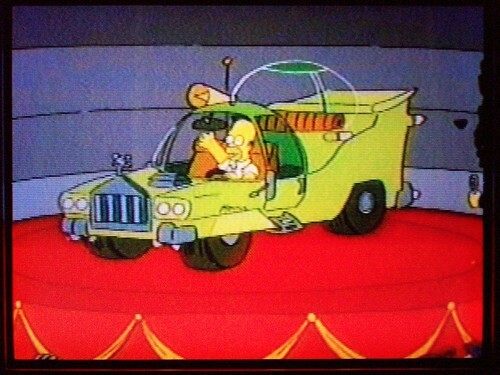 If you’re not familiar with the episode, Homer’s long-lost half-brother runs a car company and enlists Homer to design a car that the people will want, based on features the ‘average American’ wishes they had in a car. Which of course is a giant flop and ruins the company because it does none of the things an effective car should do. How do we embrace expertise and innovative practice while still balancing the ability to fill perceived need? As in all aspects of edu I don’t think there is value in resorting to a completely demand-driven model – and yet, we lose all our value if all we do is doggedly stand here and sell lemonade. *If you really can’t cope with the duck video, this paper is essentially making the same argument. Most of you are probably aware that part of my job involves running training and professional development for lecturers. For the last few years, just like everywhere else on earth, this has meant running workshops. And for the last few years I have been banging my head against the metaphoric wall because workshops are very, very broken. I’ve said before that geography and time are very poor criteria for just about anything, and workshops are a case in point. Those of you who’ve ever been involved in giving or taking PD know that there are a whole host of other reasons workshops are broken, which I won’t go into because it’s not really the point of this post and I’m probably preaching to the choir anyway. However, the nature of demand-driven systems and status-quo concepts mean that workshops are the expected form of PD delivery and doing anything different is a long, hard sell. Hence why we and everyone else have adhered to this model for so long. But. One can only deal with not doing anything about it for so long, so, long story short, this year, I’ve said ‘enough’. I’m not running workshops. Which opened up a nice array of possibilities of what one might do instead (and which happens to be the answer to the question ‘what would I do as part of the University of Awesome?’). The online shopping component fits in to the picture via the registration system. For a long time I’ve been fascinated by the idea of a course catalogue run as an online store using a shopping cart. It allows for nice possibilities like crowd-sourced course choosing (‘students who bought this course also bought…’) and bundling (‘purchase these three commonly purchased courses as a bundle…’), easy registration (email, credit card, done), tracking (both from institution and student end) and so on. It has the added bonus of, since online shopping is so ubiquitous, bucketloads of purpose-developed sites, plugins and addons that are all well-maintained and properly coded. Now, while this idea has Buckley’s of being adopted by universities any time soon, internal staff PD is an ideal test case for exploring this kind of model. I’ve been using the e-Commerce WP plugin, which, with a bit of hacky fiddling, has worked out nicely. Courses are listed as ‘products’, which staff can add to a cart, complete a simple checkout process to register, then get subscription instructions as a ‘digital download’. I won’t lie, it’s going to be a hard sell to convince people this model of PD has merit. Certainly it addresses the concerns most people have about getting to and recalling content from workshops, but it has a high level of self-directedness, and we are in the somewhat ironic position of being a major distance ed provider where many (most?) staff still do not accept online learning as a model for their own learning. It’s a battle we desperately need to have, though, so I’m willing to jump in and annoy a few people for the sake of really starting to change people’s perceptions on this. In my favour is the fact that my partner in crime, @stuffy65, is offering a webinar-based model of online PD, which still has some of the benefits above without completely blowing everyone’s minds so it’s a good complementary strand that functions as a conceptual intermediary. So – feedback. Nuts or sheer genius? What’s this kind of model missing? What’s it doing well? Would you take this kind of course in preference to a F2F workshop if you had the option?